The central assumption of The Textbook as Discourse is this: interpreted in the flow of history, textbooks can provide important insights into the nature and meaning of a culture and the social and political discourses in which it is engaged. This book is about the social, political and cultural content of elementary and secondary textbooks in American education. 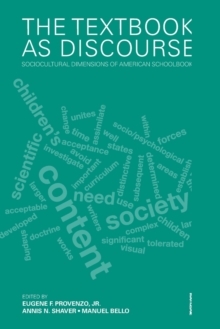 It focuses on the nature of the discourses-the content and context-that represent what is included in textbooks. The term "discourse" provides the conceptual framework for the book, drawing on the work of the French social theorist Michel Foucault. The volume includes classic articles and book chapters as well as three original chapters written by the editors. To enhance its usefulness as a course text, each chapter includes an Overview, Key Concepts, and Questions for Reflection.